New Mercedes model pushes the styling envelope. 2016 Mercedes-Benz GLE 450 AMG Coupe. There are times when an automaker shows a new model and the Internet is lit up with positive or negative comments. There are other times when all you hear is crickets. The Mercedes-Benz GLE Coupe lies somewhere between both extremes, a 2016 model due out next year. 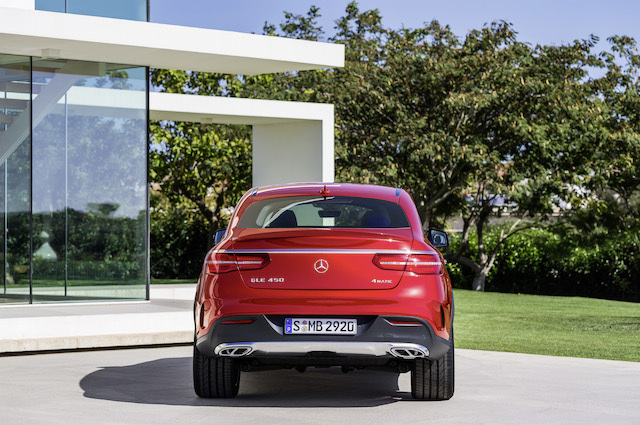 Despite the “coupe” name, the GLE is a crossover utility vehicle or what represents Mercedes’ most ambitious attempt to build a vehicle that moves away from the expected styling convention. 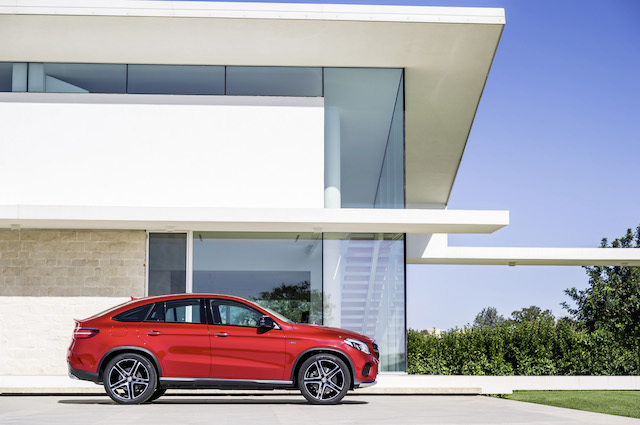 Indeed, the Mercedes-Benz GLE Coupe is different as it takes a radical styling approach currently exhibited by the BMW X6, its chief competitor. It is a style that you probably will love or hate — I have not yet decided what to make of the GLE Coupe. What I don’t like is the use of coupe for anything beside a two-door car model. Sure, the roofline is coupe-like, but we’re talking about a utility vehicle, not a car. I just wonder if this name playing is a marketing ploy, one that ultimately confuses the consumer. What the GLE Coupe does do is make an attempt to put some excitement in a segment typically devoid of it. Ask any automotive enthusiast and he or she will tell you that there are very few non-car models other than pickup trucks and select 4x4s that grab the heart in the same way as a Chevy Camaro, Porsche 911 or a heritage model like the Pontiac Bonneville does. People buy crossovers because they want the interior room and the high profile. Or so it seems. Mercedes-Benz calls the GLE Coupe “a sportier choice” and with that statement I won’t argue. It has a much more muscular appearance with strong shoulders, oversized wheels and a sloping roofline. M-B would not build such a vehicle unless it thought that there was a market for one. BMW has demonstrated that there is one — the X6 is now entering its second generation. 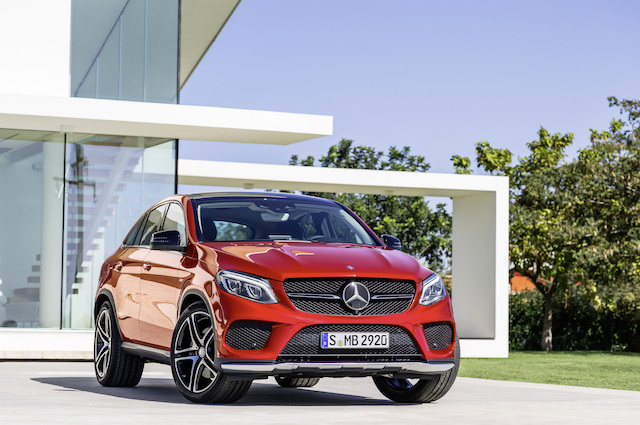 For the US market, Mercedes-Benz plans a GLE 450 AMG 4MATIC Coupe featuring a biturbo V6 engine making 362 horsepower with an output of 384 foot-pounds of twist. Besides the usual lavish equipment level, M-B says that the enhanced version will come with a DYNAMIC SELECT dynamic handling control system, a Sports Direct-Steer system and the usual driver assistance system found elsewhere in the model line. Notably, the AMG model will come with a 9G-TRONIC or nine-speed automatic transmission and 4MATIC permanent all-wheel drive. Beyond the model at hand, Mercedes is also changing its utility vehicle naming convention. The automaker says that it is paying tribute to its legendary G-Class model by assigning GL to all models except for the G itself. There is some rhyme and reason to what Mercedes is doing. For instance, the GLA represents its A-Class segment utility vehicle. The GLC, formerly the GLK-Class, is its C-Class segment model. The GLE, formerly the M-Class, is its E-Class model. The Current GL will be renamed the GLS to align it with the S-Class segment. Any lower case letter found in the name will be associated with a particular engine. Nomenclature anyone? Mercedes says the GLE Coupe’s variable dynamic control system assigns fundamentally different characteristics to the five transmission modes of INDIVIDUAL, COMFORT, SLIPPERY, SPORT and SPORT+. On the center console is a rotary controller from which the driver will choose the particular mode. If you want a soft drive, then you’ll choose COMFORT. For enhanced handling and performance, go with either of the sport modes. When the SPORT+ mode is activated, the gear changes are “acoustically accentuated” particularly when you downshift via the double-clutch function. Mercedes says that also causes the cockpit functions to respond faster. Move your eyes to the large center display and you’ll see lateral and longitudinal acceleration as well as the steering angle included in a motorsports graphic. The new model will also come with the latest version of Mercedes’ AIRMATIC air suspension. For the first time it will include the continuously variable damping system ADS Plus, what the company says “guarantees extremely stable driving.” Choose the SPORT+ mode if you want to enjoy the greatest lateral dynamics. The GLE Coupe also comes with an ACTIVE CURVE SYSTEM, what is activated when either sport mode is chosen. It provides active roll stabilization, by raising the front and rear anti-roll bars to sedan level comfort and has also been designed to mitigate certain road impacts, including pot holes. Along with the steering system, Mercedes claims outstanding handling across all operating conditions. Will the GLE Coupe succeed? Is the sky blue? Mercedes-Benz continues to sell more cars around the world and there is no reason why it will have any problem with the GLE Coupe. The new model may not appeal to everyone, but it shows that the good folks in Stuttgart aren’t about to let BMW, Audi or anyone else succeed in a segment apart from their own attempt to field a competitive model. The new naming convention may take some getting used to but there is a methodology at work too. And it is a method designed for success, something Mercedes continues to enjoy. Photos courtesy of Mercedes-Benz USA.